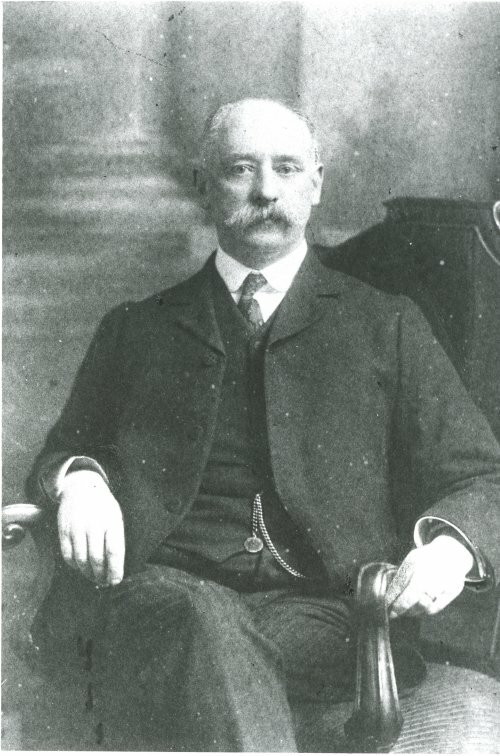 Edward Hensman was appointed first headmaster of the revived Rawlins Grammar School in 1892 and he built up the roll of pupils from 15 to about 150. He resigned in 1918 suffering from a breakdown in his health. However, from January 1919 until April 1920 he served as an assistant master at Loughborough Grammar School. His academic interest in history led him to write about the Civil War in Leicestershire. He died in 1926. Mr Edward William Hensman was a man of great personal charm, a strict disciplinarian, and a man whose life was devoted to one purpose, namely the welfare and well-being of the Rawlins School. Those of us who were privileged to be at school under Mr Hensman's headmastership, remember how, as small boys, we looked upon the 'boss' with great awe, fleeing at his approach! Then, as grew older, we became aware of his many lovable qualities, and of the great affection he had for the School and for all his pupils, past and present. As well as his manifold school duties, Mr Hensman took part in many village organisations, including night guard duty with the Civilian Volunteers. All this physical and mental strain, coupled with his increasing sorrow as the number of killed amongst the Old Boys steadily mounted, resulted in the breakdown of Mr Hensman's health, which led to his retirement in 1918. Mr Hensman belonged to a type of English schoolmaster which has passed for ever, and England is the poorer for the passing. A true gentleman, in every meaning of the word, the whole idea underlying all his teaching was to turn out from the Rawlins School, girls and boys who would go out into the world knowing how to 'play the game', and how to behave like ladies and gentlemen. Beside such an ideal everything else fades into insignificance. Edward William Hensman, God rest his soul, was a kindly Christian gentleman.